Right on your Samsung Galaxy S5's camera screen, are special options including camera settings you can choose to make recording videos or taking of pictures easy. You too can configure your phone's camera settings and make your pictures or videos special. 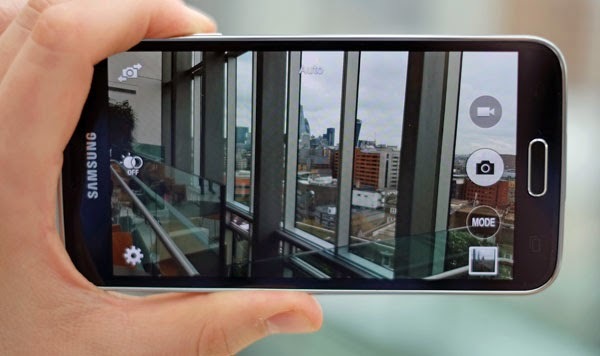 Read on to learn about how to configure the camera settings on your Galaxy S5 handset. 1. Tap on the Camera icon from the Home screen. 2. Tap to select Settings. 3. Touch and drag settings to or from the two shortcuts. B. Selecting a Shooting Mode. There are many different shootings modes available on your GS 5 device. You can use any of these modes to make your pictures or videos even better. Follow these steps to select a shooting mode on your phone. 1. Tap on Camera from Home. g. Download - This option will let you browse and/or download any other modes to use with the GS 5 camera. · Picture size: Choose a default size for the pictures you take. · Burst shots: When on, you can take multiple pictures when you touch and hold the Capture button. · Picture stabilization: When on, the Camera adjusts settings to minimize the effect of camera movement while shooting. · Face detection: When on, the Camera will automatically adjust settings for taking pictures of faces. · ISO: Set the sensitivity of the camera’s light meter. · Metering modes: Choose how the Camera measures the light source. · Tap to take pics: When on, you can tap the screen to take a picture. · Selective focus: When on, you can choose areas of the screen to focus on. · Video size: Choose a default size for videos. · Recording mode: Choose a recording mode. You can choose to limit a video to a size that can be attached to a message, or record in slow, fast, or smooth motion. · Video stabilization: When on, the Camera adjusts settings to minimize the effect of camera movement while recording. · Audio zoom: While recording videos, zooming in on an object will amplify sound from that area and diminish other surrounding sound. · Effects: Choose an effect to add to pictures. · Flash: Choose a flash setting. · Timer: Choose a timer setting to delay the taking of pictures or recording. · HDR (Rich tone): When on, you can take pictures in various exposures and merge them to create pictures with rich color. · Location tags: When on, GPS location information is stored in picture files. · Storage: If you have an optional memory card installed (not included), you can choose whether to save files to device memory or to the memory card. · Review pics/videos: When on, pictures and videos display briefly after you take them so you can review them. · Remote viewfinder: When turned on, you can take pictures using the viewfinder of a connected device. Your device and the remove device must be connected via Wi-Fi Direct connection to use this option. · White balance: Choose a setting for current light conditions. · Exposure value: Adjust the brightness of pictures. · Guide lines: When on, guidelines display on the screen to aid in composition. · Voice control: When on, you can take pictures or record videos by speaking commands. · Help: Learn about using the Camera. · Reset: Return settings to the defaults. Just choose from any of the above options to make videos and images on your Samsung Galaxy S5 even better and special.